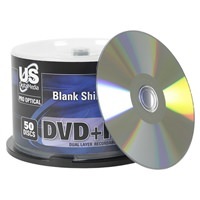 If you’re starting from scratch with your DVD project that means you’ll need blank DVD discs. Browse our selection of recordable DVD media for the best prices and selection. CDROM2Go carries blank DVD-R, DVD+R, and DVD R dual layer disc formats with a variety of print surfaces and record speeds. When you need large quantities of discs in the formats you require with excellent customer service, CDROM2GO is where you should turn. We have wholesale pricing available that fits into any budget.